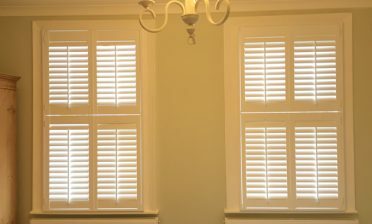 We are regularly asked to fit shutters for customer’s bay windows. These windows can be harder to dress with a robust solution compared to standard windows. 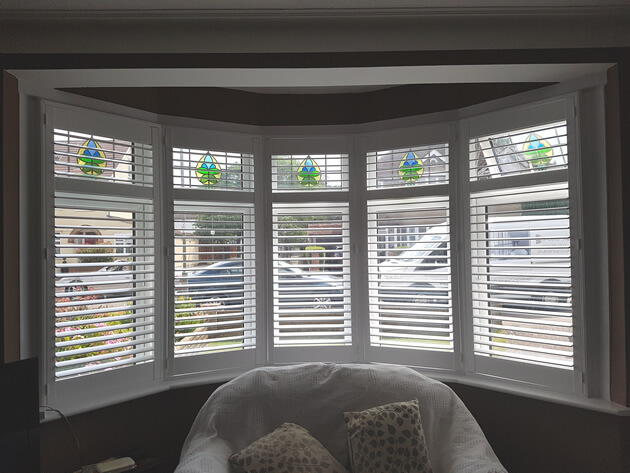 As our shutters are all designed and bespoke made around your exact windows we can install made to measure shutters on bay windows that not only fit millimetre perfect, but work with the design and decor of your existing window and rooms. 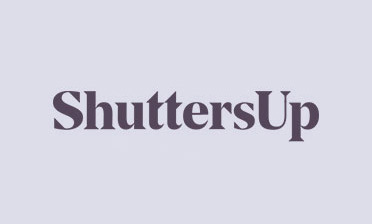 The home based in Locksbottom, Kent was to have shutters fitted to both bay windows, one upstairs in a bedroom and the other downstairs in the living room. Both faced out onto the street so privacy from the road and neighbouring houses made the use of full height shutters with mid rails a great choice to use. 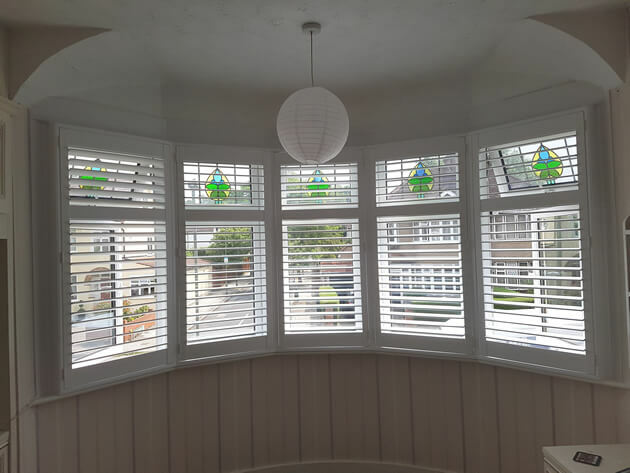 Our Fitting Technician Mark carried out the installation of these shutters, creating a matching look to both sets of windows using the bespoke built shutters that we had created for this property. The full height shutters cover the windows from top to bottom, with the mid rail installed to perfectly match up with the lines of the windows so that they look great from inside and outside of the property. The mid rail also helps strengthen the shutters and also gives the ability to adjust the shutter panels louvres at the top or bottom independently. This is great for closing or adjusting the bottom section while still allowing for maximum light to stream in through the tops. 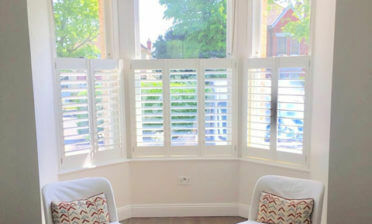 We created the shutters using our Fiji Range of hardwood with 64mm louvres and a hidden tilt rod system creating a more minimalistic look over the whole install, as there is no need for visible tilt rods to adjust the louvres! They were finished in pure white with matching hinges making them look as if they have always been there!